Grand central former bank gallery at 43 Town Square in Lima, OH. It is available to a select commercial occupant and will be finished to suit. Westerville, OH, October 16, 2017 –The City of Lima (Ohio) and developer The Woda Group, Inc., based here, held a joint press conference Friday, October 13, at 43 Town Square in downtown Lima to highlight construction details to convert the historic building into mixed- income housing and commercial office space. 43 Town Square represents an important step toward revitalizing downtown and outstanding collaboration between public and private entities working together toward that goal. Aubree Kaye, Executive Director of Downtown Lima, Inc.
Joseph M. McCabe, Vice President of Development, The Woda Group, Inc.
“43 Town Square will reflect our firm’s experience in developing mixed-use properties and in the adaptive reuse of lovely vintage buildings. This development will pay tribute to the historic architectural charm, while creating attractive, efficient spaces that will be highly desirable. We will incorporate environmentally-friendly design and construction practices and high-quality finishes,” said Joseph M. McCabe of The Woda Group, Inc. Built in 1926, the historic Lima Trust Company Building, and former First National Bank & Trust Building, is listed on the National Register of Historic Places. The 12-story building features grand Chicago style commercial architecture from the early 20th century with Renaissance Revival. The building was in need of substantial rehabilitation in order to function as a modern living or working space. The $16.7 million development is made possible, in part, with federal historic tax credits allocated through the U.S. Department of Interior, National Park Service; state historic tax credits allocated by the Ohio Development Services Agency and State Historic Preservation Office; Low Income Housing Tax Credits (LIHTC) allocated by the Ohio Housing Finance Agency (OHFA); a HOME grant from the City of Lima; a 12-year tax abatement for 50% improved value; a $1.5 million bridge loan from OHFA; and a $1.7 million permanent loan from RiverHills Bank. CREA, LLC, is investing in the LIHTC and federal historic tax credits. 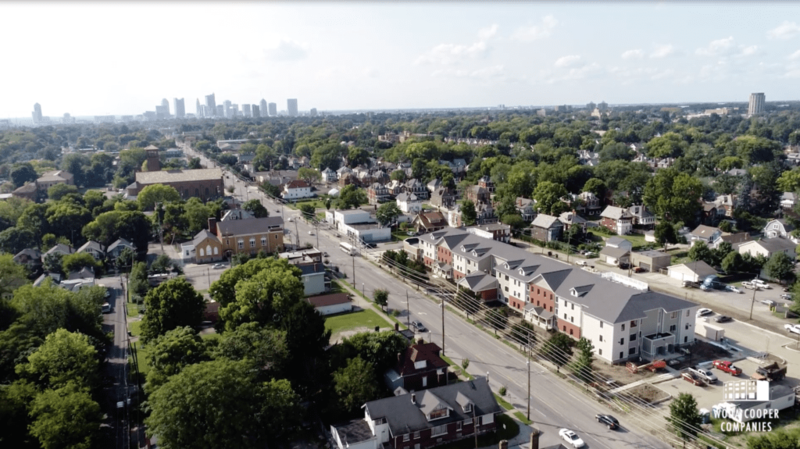 The West Ohio Community Action Partnership (WOCAP) is being tapped to develop resources as needed. These items may include assistance accessing senior services; wellness, family budgeting or parenting classes; meals; transportation; or assistance accessing other social services. 43 Town Square will offer 47 new apartments that combine vintage character with beautiful open concept design. There will be 2 one-bedroom units, 38 two-bedroom units and 7 three-bedroom units. Of those, ten will be available at market rate expected to range from $769 to $916/month and 37 units will be affordable for singles, families, students, and seniors in range of $306 to $675/month. In addition, there is 9,000 square feet of commercial space on the first floor. It is expected to be unveiled in early 2019. The Woda Group, Inc. and its affiliates are experienced developers, general contractors, and property managers specializing in the design, construction, and management of affordable multi-family apartments, senior communities, and single-family homes. Considered leading experts in the affordable housing industry, the Woda team is known for producing and maintaining high quality affordable housing. Affordable Housing Finance Magazine ranked The Woda Group, Inc. 9th overall among Affordable Housing Developers and 22nd overall among Affordable Housing Owners in its April/May 2017 issue. The Woda Group, Inc. has developed and currently manages over 300 communities and over 12,000 units. The firm has offices in Westerville, Ohio; Annapolis, Maryland; Savannah, Georgia; Shelbyville, Kentucky; Norfolk, Virginia; Indianapolis, Indiana; and Mackinaw City, Michigan. For more information, call (614) 641-2301 or visit www.wodagroup.com. Download news release: Woda43TownSquareLimaOH 10.16.17. 43 Town Square in Lima, OH, was former Lima Trust Company Building and First National Bank & Trust Building. Joseph M. McCabe details historic charm at the October 13 media walk-through. Joseph M. McCabe, Vice President of Development, The Woda Group, Inc. is leader in the development for 43 Town Square. Mayor David Berger welcomed Woda as a new corporate citizen to Lima, OH. Jacqueline Fox, Executive Director of West Ohio Community Action Partnership, described support such as accessing senior services, transportation or other social services to be available as needed by residents. Second level boardroom to be transformed to community space. Mayor David Berger casts the first demolition strike toward an upstairs wall to be removed in the renovation. From left: Susan Crotty, Community Development Director, City of Lima; Aubree Kaye, Executive Director of Downtown Lima, Inc.; Joseph M. McCabe, Vice President of Development, The Woda Group, Inc. and Mayor David Berger, City of Lima, pose after the ceremonial start of construction at 43 Town Square in Lima, OH. For more information, please contact Sharetta T. Smith, Chief of Staff, City of Lima, 419-860- 1175; or Karen Bernick, Communications Consultant, The Woda Group, Inc., 563-320-2625.